Much of what I write here relates to my own experiences, especially in tech. This weekend I read Adam Braun‘s The Promise of a Pencil, which was a phenomenal example of a story in which someone followed his passions to create value for the greater good. Apparently it’s sold out on Amazon right now, otherwise I’d tell you to go read it. A big frustration of mine when I was in banking was that I felt as though the work I was doing was simply shuffling wealth around from wealthy funds to other massive conglomerates without creating much value. I feel lucky that the company I work for now does produce a positive use-case for freedom of speech and expression around the world. I think many millennials would agree with me when they say that they hesitate to work for a company that doesn’t embody a “for purpose” motto. The mere fact that I read Young Money before I read this book juxtaposes much of what is wrong with companies that don’t have a purpose-driven path. An area that I’m intrigued about is impact investing. I stumbled upon this concept a few months ago, and I think this kind of investing is the way venture capitalists and other investors will be thinking about their returns exclusively in the next 5 years. 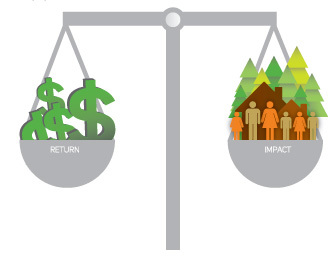 What is impact investing? Investors, whether individual angels or FINRA accredited investors, identify a return on the investment that they expect to see before giving money to a worthy recipient. In the past, that return has simply been measured in terms of the % increase of the valuation of the company, seeing their stake in the game rise and therefore, the return greater. Impact investing, however, changes the kind of return on investment expected to include non-tangible or social-impact type metrics. Plenty of funds and individuals are already doing this. There are whole companies, like the Acumen Fund, that are structured around impact investments. Individual investments are measured based on sector, but include things like number of children educated or acres of organic crop planted, instead of just % yield on money. As we think about entrepreneurship, I can’t imagine that the world of business will begin to measure ROI without measuring other impact metrics. If anyone knows about impact investing and would be willing to tell me more, I’d love to learn. Message me on twitter @ellenjdasilva. Quick addition: My friend pointed me to an incredibly useful guide her organization created to understand impact investing. Check it out here.